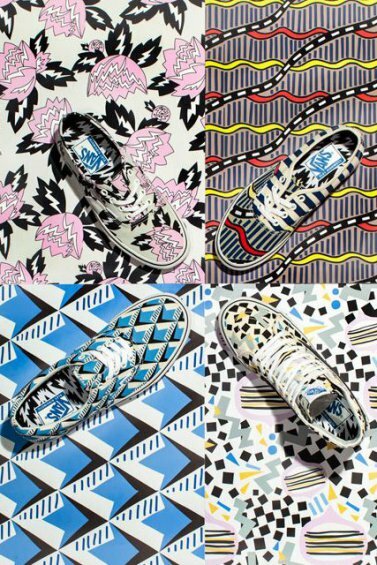 ELEY KISHIMOTO has teamed up with Vans for a collaborative summer line including footwear, apparel, and accessories for the 2015 season. With a variety of distinctive all-over prints and graphic designs, the collection is made up of attention seeking renderings of the Sk8-Hi, Slip On and Authentic. There is even a pair of beach ready flip-flops! Patterns chosen to represent the collaborative collection include ELEY KIHIMOTO’s dramatic “Flash,” and “Magnolia,” patterns plus some exclusive patters known as the “Whopping Waffle,” “Drums,” and “Bumpy Road” designs. The collection is available at Vans online store.